It seems that this abstract came online one day early on my news feed and will probably appear in Nature tomorrow. I will update this entry when the paper properly appears. This is of course very important because it directly proves that modern humans appear in Eurasia before the Upper Paleolithic revolution, and disproves the theory that modern humans spread UP technologies with an expansion out of Africa. We will have to wait until tomorrow to see exactly what they compared it against. The abstract contrasts it with "other early AMH" from the Levant, which I presume means the Skhul/Qafzeh specimens of ~50ka earlier than Manot. But, they also say that it is similar to UP Europeans and recent Africans, which suggests that they did not find any particular similarities to old African skulls of which there are many. otherAMHspecimens in the Levant between the Skhul/Qafzeh material (,120–90 kyr ago) and the later appearing Manot 1 (,55 kyr ago) does not support the hypothesis of continuous representation and local evolution of AMHs in the Levant. On the other hand, the considerably fluctuating climatic conditions during MIS 5 and 4 (favouring an alteration of differently adapted populations), the unequivocal presence of Neanderthals in the region in the time gap between early AMHs and the Manot population, and the continuing evolution of AMHs in Africa19 advocate for the most parsimonious explanation, which is that theManot people re-colonized the Levant from Africa, rather than evolved in situ. I don't buy this explanation. The key phrase is "the majority of fossils". In Figure 3 is it is clear that Qafzeh 9 is completely modern. Moreover, UP Europeans like Cro-Magnon 3, Mladec 6/5 are close to AMH Levantine specimens such as Skhul-5 and Qafzeh-6. Indeed, the late Neandertals such as Shanidar and Amud are already moving towards "modern" humans. African samples like Omo-2, LH18, and and Jebel Irhoud 1/2 don't look anything like modern humans. It is quite strange that the authors interpret this evidence as discontinuity between ~100ka humans from the Levant and replacement by a fresh Out-of-Africa wave, when in fact all the Qafzeh/Skhul remains (and a couple of Neandertals) look much more plausible relatives of Manot than any of the ancient African samples. Not single sample has been found in Africa from the mysterious hypothetical ancestral population of modern humans that supposedly colonized Eurasia ~60ka. As far as I can tell, this theory has nothing to support it, except, perhaps, (i) some misinterpretation of old genetic data based on the now discredited "fast" mutation rate, and (ii) the belief that behavioral modernity first arose in Africa and coincided with the spread of modern humans from that continent into Eurasia. 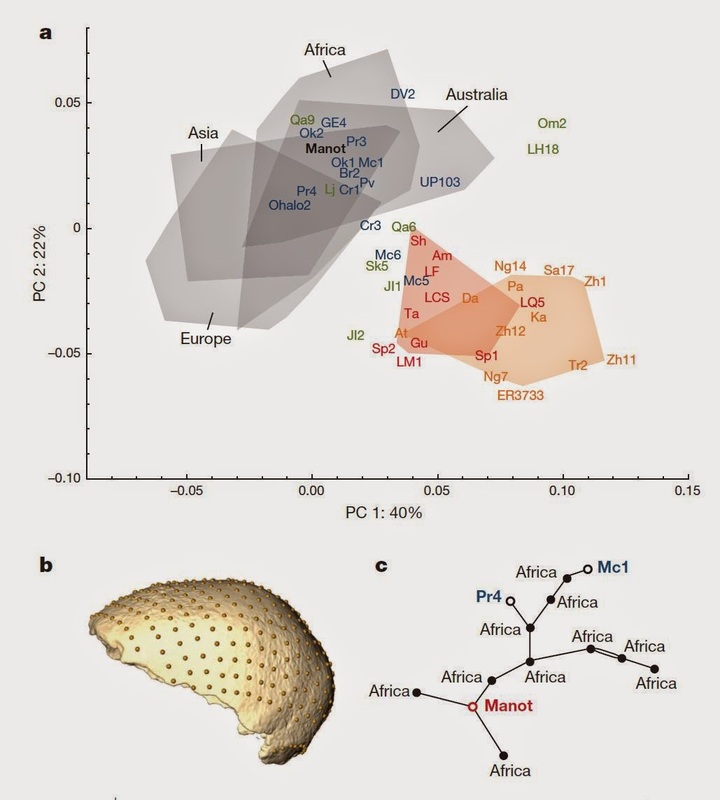 A key event in human evolution is the expansion of modern humans of African origin across Eurasia between 60 and 40 thousand years (kyr) before present (bp), replacing all other forms of hominins. Owing to the scarcity of human fossils from this period, these ancestors of all present-day non-African modern populations remain largely enigmatic. Here we describe a partial calvaria, recently discovered at Manot Cave (Western Galilee, Israel) and dated to 54.7 ± 5.5 kyr bp (arithmetic mean ± 2 standard deviations) by uranium–thorium dating, that sheds light on this crucial event. The overall shape and discrete morphological features of the Manot 1 calvaria demonstrate that this partial skull is unequivocally modern. It is similar in shape to recent African skulls as well as to European skulls from the Upper Palaeolithic period, but different from most other early anatomically modern humans in the Levant. This suggests that the Manot people could be closely related to the first modern humans who later successfully colonized Europe. Thus, the anatomical features used to support the ‘assimilation model’ in Europe might not have been inherited from European Neanderthals, but rather from earlier Levantine populations. Moreover, at present, Manot 1 is the only modern human specimen to provide evidence that during the Middle to Upper Palaeolithic interface, both modern humans and Neanderthals contemporaneously inhabited the southern Levant, close in time to the likely interbreeding event with Neanderthals. This seems like a very interesting project that has an associated Youtube channel. Old works of physical anthropology often included galleries of physical types of different ethnic and racial groups, and for many people this would have been one of the few opportunities to see people much different than themselves. 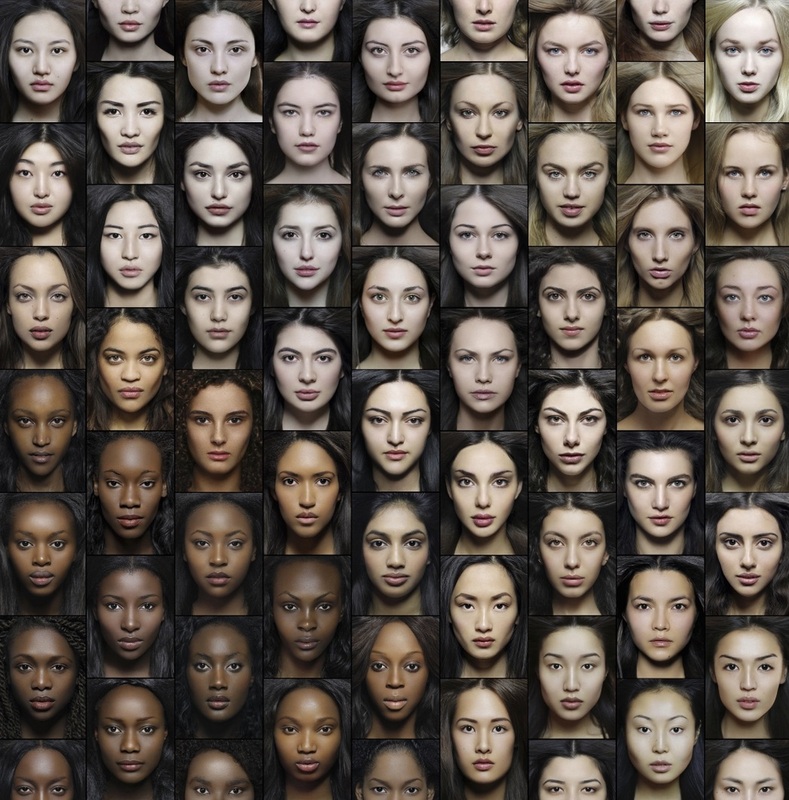 It is nice to see modern technology being used to preserve a snapshot of the appearance of (admittedly not-average) examples of living ethnic groups. Of course, this is not a problem for the more populous or culturally prominent ethnic groups of the world, but when was the last time you saw what a Kalmyk, Uyghur, Kyrghyz, Altaian, Bashkir, or Lezgin looked like? (There seem to be English, French, and Russian versions of some of these materials). Ancient DNA research has focused on the genetic patterns of the earliest farmers during the European Neolithic, especially with regards to the demographic changes in the transition from hunting and gathering to agriculture. However, genetic data is relatively lacking after this earliest transition period, when societies had fully adapted to new agrarian lifestyles specific to their local environment. During the later central European Neolithic (ca. 3600–2800 cal BC), large-scale collective burials and monumental architecture appeared within the landscape of many agricultural societies. This phenomenon has been argued to represent the emergence of a “collective” identity. With the aim of exploring genetic-based relations among individuals collectively buried, we obtained human skeletal remains of nearly 200 individuals from four later Neolithic collective burial sites in Germany: Calden, Odagsen, Groβenrode, and Panker. We successfully reproduced reliable mitochondrial DNA (mtDNA) haplotypes from eight Neolithic individuals, which were assigned to haplogroups H, HV0, and X2. Shared haplotypes observed among individuals within Calden and Odagsen suggest that genetic relations may have shaped the arrangement of the deceased within later Neolithic agricultural groups. 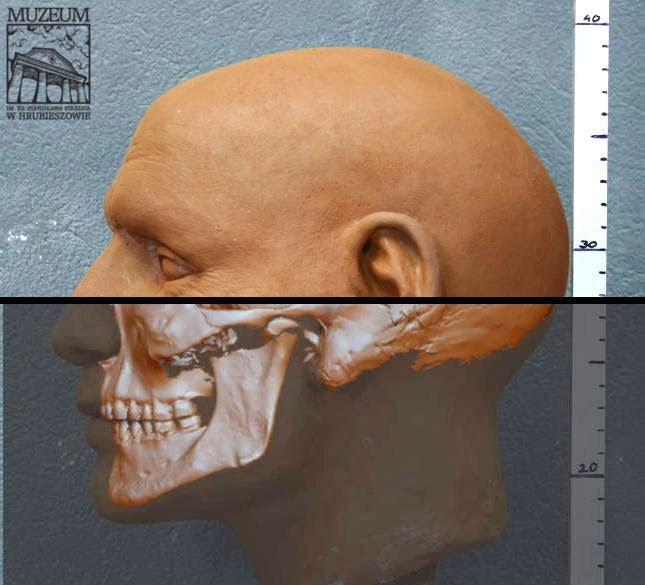 Skull warrior was in such good condition that the museum was tempted by an experiment - a reconstruction of his face. Tasks undertaken by the research team of Dr. Dorothy Lorkiewicz-Muszyńska of the Department of Forensic Medicine, University of Medical Sciences. Every day with their ability to use the police, for example, when you need to identify a murder victim. The first step was to make a 3D scan of the skull. - At the base using a special computer program was applied to the muscle tissue - explains the director Bartecki. - Method shows more than 90 percent. compliance with the real appearance of a man - says. Proved invaluable assistance skeleton results Rogalin. Also genetic. Thanks to them, we know that the warrior had a dark complexion, dark hair and eyes. This combination of traits is rather uncommon in modern Poles. It seems that eastern Europeans looked quite different four thousand years ago than they do today. The Greek Ministry of Culture has announced the long-awaited results of the analysis on the bones found inside the 4th century BC tomb uncovered in Amphipolis in northern Greece, and the news is quite unexpected – the bones belong to not one, but five individuals, pointing to the likelihood that it is a family tomb. The scientific team will continue to carry out in-depth studies of the bones, including DNA analysis, to obtain more detailed information about the individuals including their diet, their affinity and place of origin, whether they grew up in Amphipolis or had moved from elsewhere, when they were buried/cremated, and whether the individuals are related to each other. This is an interesting thesis which could be further examined if the researchers could undertake an examination of whether the under-represented groups do not have a deficiency of brilliance, but rather an over-abundance of modesty. Such an abundance would lead them to underestimate their own brilliance and thereby avoid areas where is is overvalued. Genetic analysis is still under way in Denmark, but documents obtained through the federal Freedom of Information Act say preliminary results point to a Native-American heritage. Willerslev’s Danish lab is a world leader in ancient DNA analysis. Last year, he and his colleagues reported the genome of the so-called Anzick boy, an infant buried 12,600 years ago in Montana. He, too, was a direct ancestor of modern Native Americans and a descendant of people from Beringia. Until details of the Kennewick analysis are published, there’s no way to know what other relationships his genes will reveal, Kemp said. It may never be possible to link him to specific tribes, partly because so few Native Americans in the United States have had their genomes sequenced for comparison. The recent publication of the Kostenki-14 genome, which has been described as morphologically Australoid, but appears to be genetically European should make us wary of interpreting phenotypes of early specimens in terms of the much later human populations. In the case of Europeans, it seems that the Caucasoid genetic lineage existed even before full Caucasoid morphology had evolved (at least in some specimens of Upper Paleolithic Europeans, as others had clear Caucasoid morphology). I would not be surprised if the same was true for Native Americans, that is, the typical morphology of recent Native Americans was not present in their earliest predecessors, who, nonetheless, were part of the same evolving lineage of humans in the Americas. The Anzick-1 genome from the Clovis culture and several mtDNA results have not really turned up anything "exotic" in ancient inhabitants of the Americas, so it seems that the hypothesis of recent Native Americans being descended from a wave of people that replaced earlier inhabitants is losing ground with each new discovery. This is a very exciting paper. Most of these lineages are so young that there are good chances that their founders were figures from history or mythology. The most interesting one is DC2 which was also found in south Siberian Kurgans, belongs to haplogroup R1a1 and is given an age of 3,284 years by the authors (with some almost impossibly wide confidence intervals). Based on its distribution, and if a Bronze Age date is right, it is difficult to see in it anything other than a patrilineage that was present in Proto-Indo-Iranians. A Spatial Framework for Understanding Population Structure and Admixture. Geographic patterns of genetic variation within modern populations, produced by complex histories of migration, can be difficult to infer and visually summarize. A general consequence of geographically limited dispersal is that samples from nearby locations tend to be more closely related than samples from distant locations, and so genetic covariance often recapitulates geographic proximity. We use genome-wide polymorphism data to build “geogenetic maps”, which, when applied to stationary populations, produces a map of the geographic positions of the populations, but with distances distorted to reflect historical rates of gene flow. In the underlying model, allele frequency covariance is a decreasing function of geogenetic distance, and nonlocal gene flow such as admixture can be identified as anomalously strong covariance over long distances. This admixture is explicitly co-estimated and depicted as arrows, from the source of admixture to the recipient, on the geogenetic map. We demonstrate the utility of this method on a circum-Tibetan sampling of the greenish warbler (Phylloscopus trochiloides), in which we find evidence for gene flow between the adjacent, terminal populations of the ring species. We also analyze a global sampling of human populations, for which we largely recover the geography of the sampling, with support for significant histories of admixture in many samples. This new tool for understanding and visualizing patterns of population structure is implemented in a Bayesian framework in the program SpaceMix. Elsewhere (Batini C, Hallast P, Zadik D, Maisano Delser P, Benazzo A, Ghirotto S, Arroyo-Pardo E, Cavalleri GL, de Knijff P, Dupuy BM, Eriksen H, King TE, López de Munain A, López-Parra AM, Milasin J, Novelletto A, Pamjav H, Sajantila A, Tolun A, Winney B and Jobling MA, submitted.) we have described an NGS-based MSY phylogeny based on 5,996 SNPs ascertained in 334 human Y chromosomes comprising 17 population samples from Europe and the Near East, focused on illuminating the origins and histories of European patrilineages. Generally, the STRs perform poorly, giving a wide variety of TMRCAs for nodes with similar SNP-based dates, and correlation coefficients consistently below 0.6. Considering the variables described above: 1) ASD generally outperforms rho, and choice of rooting method (ancestral or modal) makes little difference. For rho, rooting through the ancestral haplotype performs much worse than through the modal haplotype; 2) removal of RM-YSTRs, and STRs showing repeat array complexity, does not have a major influence on relationships between SNP- and STR-based estimates of TMRCA, and the effects depend upon how the root is specified; and 3) the evolutionary STR mutation rate consistently overestimates, and the pedigree rate underestimates, the TMRCAs of nodes (fig. 4a). As expected, the pedigree mutation rate performs better for young nodes (less than 10 ka; supplementary table S6, Supplementary Material online), whereas the evolutionary rate performs better for older nodes. Pille Hallast, Chiara Batini, Daniel Zadik et al. Many studies of human populations have used the male-specific region of the Y chromosome (MSY) as a marker, but MSY sequence variants have traditionally been subject to ascertainment bias. Also, dating of haplogroups has relied on Y-specific short tandem repeats (STRs), involving problems of mutation rate choice, and possible long-term mutation saturation. Next-generation sequencing can ascertain single nucleotide polymorphisms (SNPs) in an unbiased way, leading to phylogenies in which branch-lengths are proportional to time, and allowing the times-to-most-recent-common-ancestor (TMRCAs) of nodes to be estimated directly. Here we describe the sequencing of 3.7 Mb of MSY in each of 448 human males at a mean coverage of 51×, yielding 13,261 high-confidence SNPs, 65.9% of which are previously unreported. The resulting phylogeny covers the majority of the known clades, provides date estimates of nodes, and constitutes a robust evolutionary framework for analyzing the history of other classes of mutation. Different clades within the tree show subtle but significant differences in branch lengths to the root. We also apply a set of 23 Y-STRs to the same samples, allowing SNP- and STR-based diversity and TMRCA estimates to be systematically compared. Ongoing purifying selection is suggested by our analysis of the phylogenetic distribution of nonsynonymous variants in 15 MSY single-copy genes. Apart from the historical interest, this study might be useful to further calibrate the Y-chromosome molecular clock. The Y-SNP mutation rate was previously calibrated with a Chinese pedigree that went down to ~1800AD, and this is potentially much deeper. (Submitted on 19 Dec 2014) House of Aisin Gioro is the imperial family of the last dynasty in Chinese history - Qing Dynasty (1644 - 1911). Aisin Gioro family originated from Jurchen tribes and developed the Manchu people before they conquered China. By investigating the Y chromosomal short tandem repeats (STRs) of 7 modern male individuals who claim belonging to Aisin Gioro family (in which 3 have full records of pedigree), we found that 3 of them (in which 2 keep full pedigree, whose most recent common ancestor is Nurgaci) shows very close relationship (1 - 2 steps of difference in 17 STR) and the haplotype is rare. We therefore conclude that this haplotype is the Y chromosome of the House of Aisin Gioro. Further tests of single nucleotide polymorphisms (SNPs) indicates that they belong to Haplogroup C3b2b1*-M401(xF5483), although their Y-STR results are distant to the "star cluster", which also belongs to the same haplogroup. This study forms the base for the pedigree research of the imperial family of Qing Dynasty by means of genetics. Xinjiang is at the crossroads between East and West Eurasia, and it harbors a relatively complex genetic history. In order to better understand the population movements and interactions in this region, mitochondrial and Y chromosome analyses on 40 ancient human remains from the Tianshanbeilu site in eastern Xinjiang were performed. 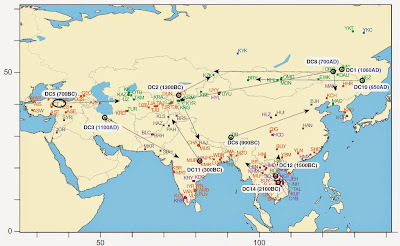 Twenty-nine samples were successfully assigned to specific mtDNA haplogroups, including the west Eurasian maternal lineages of U and W and the east Eurasian maternal lineages of A, C, D, F, G, Z, M7, and M10. In the male samples, two Y chromosome haplogroups, C* and N1 (xN1a, N1c), were successfully assigned. 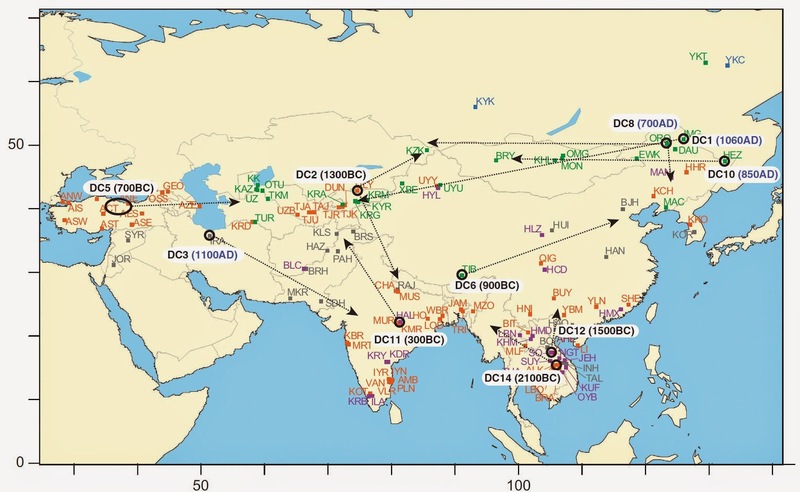 Our mitochondrial and Y-chromosomal DNA analyses combined with the archaeological studies revealed that the Di-qiang populations from the Hexi Corridor had migrated to eastern Xinjiang and admixed with the Eurasian steppe populations in the early Bronze Age. This article evaluates bias in one class of methods used to estimate archaic admixture in modern humans. These methods study the pattern of allele sharing among modern and archaic genomes. They are sensitive to "ghost" admixture, which occurs when a population receives archaic DNA from sources not acknowledged by the statistical model. The effect of ghost admixture depends on two factors: branch-length bias and population-size bias. Branch-length bias occurs because a given amount of admixture has a larger effect if the two populations have been separated for a long time. Population-size bias occurs because differences in population size distort branch lengths in the gene genealogy. In the absence of ghost admixture, these effects are small. They become important, however, in the presence of ghost admixture. Estimators differ in the pattern of response. Increasing a given parameter may inflate one estimator but deflate another. For this reason, comparisons among estimators are informative. Using such comparisons, this article supports previous findings that the archaic population was small and that Europeans received little gene flow from archaic populations other than Neanderthals. It also identifies an inconsistency in estimates of archaic admixture into Melanesia. Since I didn't get my wish for any ancient African DNA last year, I repeat it for this year as well.